Trina looks after the front of the winery. Her enthusiasm for our wines and her ready smile make her perfect for the job. She helps PondView guests with tastings, tours, and pairing suggestions, and keeps all things running smoothly. I got into the industry because I love food and wine. I worked as a professional cook for nearly a decade, and then had a private business for another 14 years. I’ve now been in the wine industry for the last ten years, and have taken several wine certificate courses through Brock University. My favourite PondView wine is whatever the day decides. Is it sunny or cloudy? Warm or cool? What kind of mood am I in? One of the great things about wine is that there’s a perfect match for any day and any mood. The best part about the Estate is looking out over the vineyards at the Escarpment. I love the atmosphere here. Before I became a PondView employee, I was a frequent customer. Sitting out on the patio with a platter and a glass of wine, I remember thinking how great it would be to work here, and get to visit this beautiful place every day. As it turns out... it really is. If I had to recommend just one wine, it would be tragic! 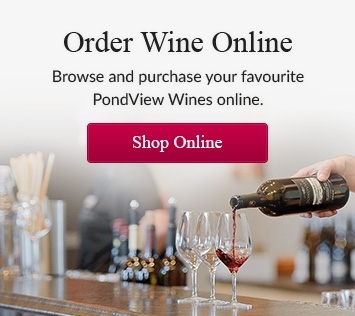 There are too many wonderful PondView wines to sample, and all of the fun is in discovering something new. Be sure to try as many as you can! I’d serve my wine of the moment on our patio, with a cheese or antipasto platter. It’s really the perfect place to just unwind and enjoy the afternoon.